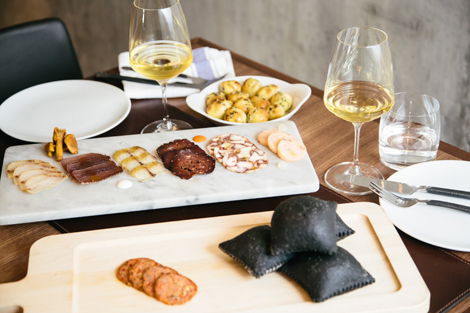 Opened last autumn, next door to the Four Seasons hotel, Buca Osteria and Bar (also known as Buca Yorkville) is the King Street Food Company’s third outpost under the brand. Over on 75 Portland Street there is the less formal Bar Buca, while Buca on King Street West is considered the flagship. The food is conceived, crafted (and frequently photographed) by executive chef Rob Gentile – you can visit his Instagram account here. 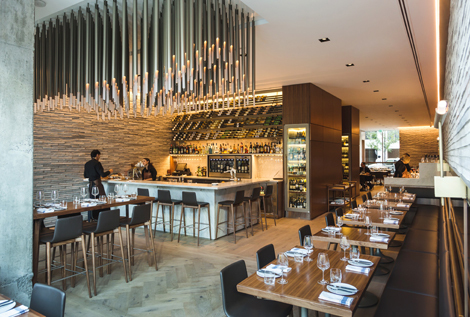 The Italian menu at Buca Yorkville has an emphasis on fish and seafood (lots of it served raw), whereas the King Street branch opts for meatier recipes. The King Street Food Company has also partnered with British celebrity chef Jamie Oliver to open a restaurant in the Yorkdale shopping centre later this year. 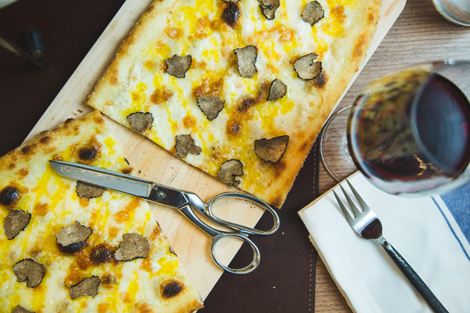 Tucked away off the main road, on the ground floor of the Four Seasons’ private residences building, 90-seat Buca is a smart, businesslike establishment. The top class food and outstanding service make it perfect for dinners with clients, and yet there is none of the stuffiness of traditional formal Italian restaurants (white linen table cloths, rows of cutlery, and so on). There is also a semi-private dining room for 12. 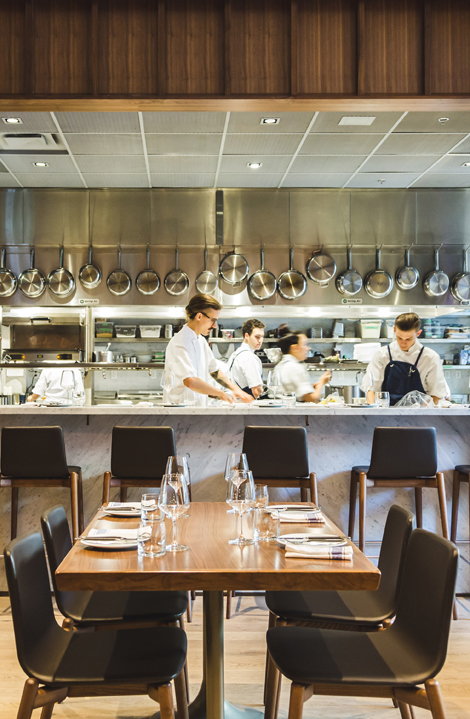 There are sit-up stools and marble counters, black leather benches, an open kitchen (with front row seating) and polished wooden tables set with side plates and organic cotton napkins. A modern approach to dining. When I arrived in the evening, the lighting was set low (so low in fact that it was hard to take decent photos of the food, but this was probably a good thing as I get easily distracted). It feels upmarket and urbane, and is popular among locals. Coming from London, I am often impressed by the effusive eloquence of waiting staff in North America, and at Buca they get it just right; chatty, professional, sincere, and knowledgeable about the food and drink. We were welcomed with a glass of prosecco on arrival. Our waiter was Jasper, a very well suave chap who couldn’t have been more hospitable – even when a third friend joined us later for dessert, he moved us to a bigger table with nothing but smiles. Of course you can get things started with a classic Bellini, but Buca also serves some inventive house cocktails such as the Ciociara (Bombay Sapphire, homemade grenadine, tonic, lemon and Herbsaint), the Tempesta (Kraken run, ginger beer, Cynar and lime) and the Manhattan Siciliano (Four Roses bourbon, Amaro Averna and Buca bitters). Whet you appetite with some warm bread knots slathered in olive oil, rosemary and garlic. For me, they proved one of life’s simplest pleasures. As mentioned previously, fish and seafood play a big part in the menu (which changes regularly), with Mediterranean classics such as salt-baked fish (served on a trolley), as well as more unusual housemade salumi di mare (three types for CA$19/£9, five for CA$29/£14). My companion, JLR, grazed on slender marbled slices of octopus salami, scallop and lobster sausage, and side striped shrimp mortadella with clay pepper and pistachio, while I went for an Italian dandelion salad (earthy, bitter greens sweetened with balsamic). 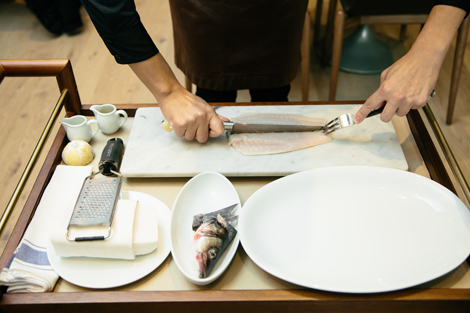 Next came the show-stopper – a whole raw Cyprian sea bass (CA$49/£24) carved expertly at the table (after being de-boned in the kitchen) into paper-thin sashimi slices and arranged on a plate. It was then drenched in olive oil and fresh lemon juice, and seasoned with salt grated from a block. It was wonderfully delicate, zesty, fresh and light. Unless you want to continue with plates to share, mains include decadent paste such as the Bigoli (duck egg pasta with duck offal ragu, Venetian spices, mascarpone and basil); as well as gnocchi with braised rabbit, ferment butter, fagiolini and buffalo Parmigiano; and milk-poached veal tenderloin with chanterelle mushrooms, fava beans and white asparagus. The grilled Nova Scotia swordfish also sounded good. We decided to try one of the simplest things on the menu (and in my opinion as good a test of a chef as anything) – a pizza of tomato, burrata, fresh basil and olive oil. Crisp yet elastic with a rich sauce and luscious cheese, it was presented on a wooden board with scissors to cut it into pieces.It took me back to hot summer nights in Napoli. You can also choose from pizze bianche, with the Fiori di Zucca catching my eye (courgette blossoms, buffalo ricotta, lemon, heirloom cherry tomato and parsley). In fact, now I wish I’d tried that one. After several glasses of delicious Brunello, dessert was a pretty torta di frutti di bosco (spongy semolina cake, steeped in red juice and topped with sugar-dusted berries). I was seriously impressed with the food and the service at Buca. (Now I know why JLR is a regular.) At the same time as excelling in the classics, it succeeds in serving up dishes that are also refined and modern, but without being fussy or gimmicky. I thoroughly enjoyed my evening here and look forward to going back next time I am in town. OPENING HOURS Mon-Wed 11.30am-10pm, Thurs-Fri 11.30am-11pm, Sat 10am-11pm, Sun 10am-10pm. PRICES Pasta CA$19-CA$55 (£9-£27), pizza CA$19-CA$29 (£9-£14), raw CA$21-CA$49 (£10-£24), whitefish/branzino/mackerel/arctic char (880g-1,100g whole) CA$80-CA$110 (39-£54).